Family Separation Is Trump's Immigration Policy. So Why Won't He Own It? The policy is unpopular, and vulnerable Republicans in competitive districts stand to be punished by voters in the midterms if this continues much longer. So Trump is trying to flip the script. 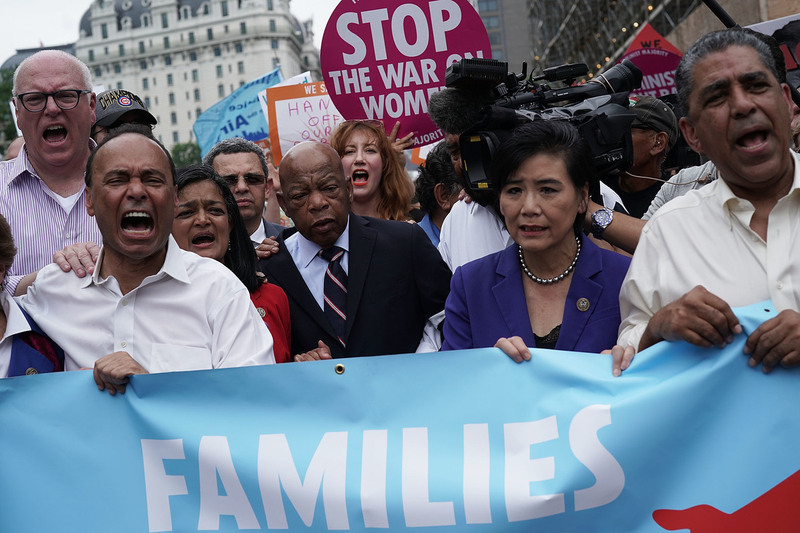 Democratic members of Congress protest the Trump family separate policy. From left to right: Reps. Joseph Crowley, Luis Gutierrez, Pramila Jayapal, John Lewis and Judy Chu. The president on Tuesday called on Congress to come up with a "third option": for the legal authority to detain and promptly remove families together as a unit. This is similar to a practice used during the Obama administration, when some families were detained together. That, too, was criticized, but it is emerging now as a preferred alternative. Some immigrants under Presidents Obama and George W. Bush were released while they awaited adjudication, but that approach is one Trump and conservative critics chafe at, calling it "catch and release." Trump White House officials say that's not an option this president wants to consider since their stated policy is "zero tolerance" for people who cross the border illegally. A hard line on immigration was a fundamental ideological underpinning of Trump's candidacy. Now, the country is seeing the practical implementation of that ideology, especially after a year in which little got done legislatively on immigration. Trump, though, appears to be looking for a way out of the bad optics and bad politics — without looking like he's compromising his principles. The president huddled with House Republicans Tuesday afternoon. They're considering several bills, but the strings attached, as always, will be what determines if they pass. Hard-liners and the Trump administration want to see what they can get on the president's other immigration priorities. But there's only so much moderates and Democrats are willing to give on this. Senate Majority Leader Mitch McConnell said he wants a narrow bill that deals strictly with family separation. "In order to fix this problem you can't fix all the problems," he told reporters. "We've wrestled with this issue for a decade." The reality is, you don't need to look very far to see which way the wind is blowing on this issue. Not only is the president declining to take full ownership of the policy, but Democrats see no political reason to capitulate, and that leaves moderate Republicans feeling the most heat. Congressional Republicans, especially those in vulnerable House districts, are the ones who most want this issue off the table quickly. That's why Ohio Rep. Steve Stivers, head of the National Republican Congressional Committee, came out against the policy. He encouraged the Trump administration to "stop needlessly separating children from their parents," he said in a statement on his Facebook page. "If the policy is not changed, I will support other means to stop unnecessary separation of children from their parents." House Republicans see the numbers (the public and private ones). Four public polls were released on the subject over the last couple of days — from CBS News, CNN/SSRS, Ipsos/Daily Beast and Quinnipiac. And they all show big majorities, around two-thirds of Americans, disapproving of separating families at the border. But there's a catch: they mostly show more Republicans approve than disapprove of the policy. That puts Republicans, especially those still facing primaries, in a predicament — break with the president and risk facing a tough challenge over a cultural issue that fires up the base, or agree with him and risk losing in a general election in swing districts, where moderate Republicans and independents, who disapprove of the policy, are key to their re-election. Trump has, of course, argued that this is all the fault of the Democrats. "I hate the children being taken away," Trump told reporters Friday outside the White House. "The Democrats have to change their law. That's their law." Back at the end of May, Trump also blamed Democrats for their "horrible law that separates children from there [sic] parents once the cross the Border" and encouraged people to "put pressure" on them. And on Monday, Department of Homeland Security Secretary Kirstjen Nielsen took to the podium in the White House briefing room and said, "[I]t's a law passed by the United States Congress. Rather than fixing the law, Congress is asking those of us who enforce the law to turn our backs on the law and not enforce the law. It's not an answer. The answer is to fix the laws." Nielsen leaned hard on talking about "the law" or "laws" — 34 times, in fact, in a 25-minute briefing. But it's neither Democrats' law nor a law at all. So what is the Trump administration talking about? The heart of their argument is based on a legal settlement, the Flores Settlement Agreement. The lawsuit against the former Immigration and Naturalization Service began in 1985 and was finally settled under the Clinton administration in 1997. Human Rights First, an international human-rights nonprofit, notes the suit was brought "on behalf of immigrant children who had been detained" seeking better treatment. Doris Meissner, who was head of INS at the time and signed the settlement, talked to NPR's Michel Martin on Saturday's All Things Considered. She explained that Flores is not a law, that it does have the "force of law," but it's a "judgment" on the part of the Trump administration on "how to implement that court decision." "[T]his implementation of the court decision that says children need to be separated from their parents because their parent is being prosecuted — that has never happened before in the past from the time that this settlement took place through other administrations, both Democratic and Republican administrations," Meissner said. "Everybody has recognized that this issue is a balancing act — that we, of course, have a responsibility to enforce the laws at the border. But to those who are especially vulnerable — young people and families — there are other measures that can be taken that, of course, enforce the law but are not so excessively harsh as to violate a principle so fundamental as young children being in detention for long periods of time." Trump and his officials in the administration show no signs of backing down. But Republicans, worried about their own re-elections, want to get this out of the way quickly. Judging by his tweets and messaging, so does the president. But it's not his job on the line this year.